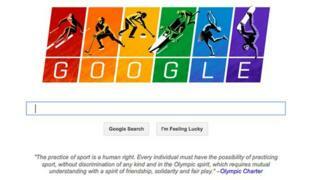 Google has joined the chorus of US companies speaking out against Russia's law restricting gay rights activities. Its so-called 'Google doodle' homepage icon has been updated to show illustrations of athletes against a rainbow-coloured backdrop - a symbol of the gay rights movement. The Winter Olympic Games are due to open on Friday. Last year, Russia banned the promotion of "non-traditional" sexuality. The law makes providing information on homosexuality to under-18s a crime, punishable by a fine. Critics say its loose interpretation effectively stops gay rights protests in Russia. Google declined to comment on the new image, saying it wanted the illustration to speak for itself. Although Google is not an Olympics sponsor, its action came a day after three sponsors of the US Olympic Committee - AT&T, DeVry University and yogurt maker Chobani - issued statements explicitly speaking out against the Russian law. In a corporate blog post, AT&T condemned Russia's stance, saying it stood "against Russia's anti-LGBT [lesbian, gay, bisexual and transgender] law". The telecommunications giant is not an IOC sponsor but it does sponsor the US Olympic Committee. Last month, President Vladimir Putin said homosexuals would be welcome in Sochi for the Olympics but added: "Just leave the children in peace." "We don't have a ban on non-traditional sexual relations," he said. "We have a ban on the propaganda of homosexuality and paedophilia."